In today's demand driven, fast paced and competitive environment, very few organisations conduct reviews of project failures or poor performance. They, prefer instead to breathe a collective sigh of relief and move past the difficulties as quickly as possible. In response to this behaviour, some companies have implemented an Agile development approach to solve project problems and poor business engagement. Agile is positioned as a silver bullet and has gained significant momentum over the years. It is regarded by many as the answer to the complex problem of project delivery. It prescribes a collaborative approach to a number of common issues and honestly attempts to break through the well-recognised failings of other models. CMMI takes a holistic approach to an organisation's capability, not just focusing on software development or project delivery. It focuses on how capable an organisation is and how mature the processes are. For Agile to be implemented successfully, an appropriate level of maturity is essential (typically CMMI level 2 to3, the higher the better). The common denominators between Agile and CMMI are defined structure, adherence to processes, discipline and repeatability. The goal of CMMI is to align the organisation to a common level of capability maturity, identifying weaknesses and addressing them accordingly across all competencies. Conversely, an Agile only delivery methodology will not automatically resolve organisational and cultural inadequacies. Lack of discipline and an inability to follow processes, are significant inhibitors to capability uplift for both Agile and CMMI. When the dimension of capability maturity is considered, it becomes immediately obvious that a gap exists between the Agile proposition and CMMI. Agility is a function of maturity and not the other way around. Large organisations need to implement a scaled agile framework such as SAFe so that Agile can be taken to the next level. 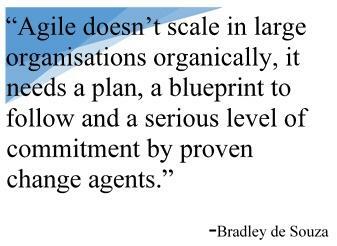 Agile doesn't scale in large organisations organically, it needs a plan, a blueprint to follow and a serious level of commitment by proven change agents. Many practitioners blame failed Agile projects on a lack of dedication to the methodology. This all or nothing approach is difficult to achieve for large projects in big organisations. Most organisations are generally not prepared to commit to a long-term solution. Pressure to measure quarter on quarter performance drives an addiction to silver bullet solutions rather than looking at the problem from more angles. This is where capability maturity comes into play. There is a crossover point between the Agile methodology and CMMI. There is a strong correlation between successful Agile projects and CMMI level 3+ organisations. At CMMI level 3, processes are well characterised and understood. They are described in standards, procedures, tools, and methods. The organisation's set of standard processes, which is the basis for level 3, is established and improved over time. These standard processes are used to establish consistency across the organisation. Projects build upon the organisation's set of standard processes, tailoring them accordingly. The organisation's management establishes process objectives based on the company's set of standard processes and ensures these objectives are appropriately addressed. It may seem obvious, but project failures are more likely to occur in CMMI level 1 to 2 organisations. In these organisations, even successes aren't always what they seem. Upon closer inspection, a lack of a defined approach, technical standards, processes and governance, hides the amount of technical debt or compromise that was agreed in order to meet deadlines. Success in these organisations depends on the competence and heroics of the people in the organisation and not on the use of proven processes. In spite of this ad-hoc, chaotic environment, CMMI level 1 organisations often produce products and services that work; however, they frequently exceed budget and schedule. Level 1 organisations are characterised by a tendency to over commit, abandon processes in the time of crisis, and not be able to repeat past successes. ile methodology in response to project failures are at CMMI level 1. They ignore the fundamental immaturity which produced the failures to begin with and instead seek to 'quick fix' the problems with an Agile approach. This can only serve to exacerbate the problems caused by lack of documentation, poorly defined requirements, inadequate financial oversight, bad planning, etc. Maturity and agility are not two sides of the same coin or are they interchangeable, instead one is a precursor of the other. Getting the order right is the key to delivering projects successfully, on time, to budget and meeting the requirements.